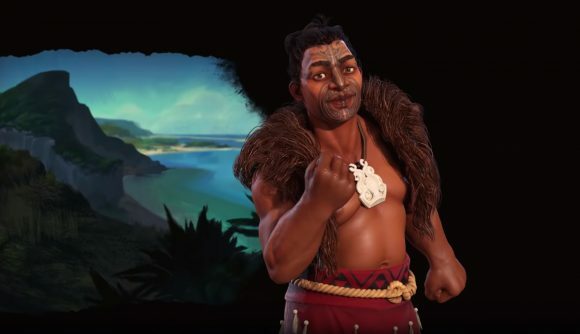 Civilization VI: Gathering Storm will bring us the Maori, who are now the second officially-revealed addition to the civ roster. Kupe will serve as the civ’s leader here – according to historical Maori legend, he set sail from Hawaiki and discovered the land that would eventually be known as New Zealand and eventually led his people to migrate there. That translates to a unique starting position, as the Maori begin the game at sea. The leader’s unique ability is Kupe’s Voyage, which sets the Maori far apart from other civs. You’ll start the game at sea and gain bonus science and culture until you pick a spot to place your first settlement. Once you do, you’ll get a free builder, extra population, and additional housing and amenities. Since you're starting on the ocean, Mana, the civ’s unique ability, naturally gives you sailing and shipbuilding technologies from the very beginning of the game, as well as improved movement and combat abilities for units that have embarked. This ability also gives you bonus production in woods and rainforests, as well as bonus food from fishing boats. The production bonuses mean you’ll have a great incentive to sail around and find the perfect spot for your capital, and the early bonuses provided by the leader ability ensures you won’t fall behind while you’re looking. This makes the Maori pretty unique among the list of civilisations, and should make for an entertaining new play style in the early game. Your unique building is the Marae, which replaces the amphitheater and provides culture and faith to nearby tiles with passable features, in addition to tourism once you’ve unlocked flight. You’ll also get a unique classical-era melee unit in the Toa, which is able to construct the Pa. That’s a defensive structure that can gives combat bonuses for allied units occupying it. The Toa have their own bonuses with the Haka War Dance ability, which can debuff adjacent enemy units. This reveal follows up on Hungary, and it should be noted that both official announcements have perfectly tracked with a leak that hit the internet back in November. That leak even included an image of Kupe that perfectly matches today’s reveal, so it looks like that rumoured list is going to pan out entirely ahead of the Gathering Storm release date. We’ll get more official details on the new civs leading up to that point, though, so stay tuned for further reveals as they come in.